Enjoy buy-1-get-1 offer at Costa Coffee with our Visa Infinite and Platinum credit cards. “Buy-1-get-1” at Costa Coffee valid only when the purchases are made using Standard Chartered Visa Credit Cards. The free item will be equal or lesser value than the value of the item purchased. 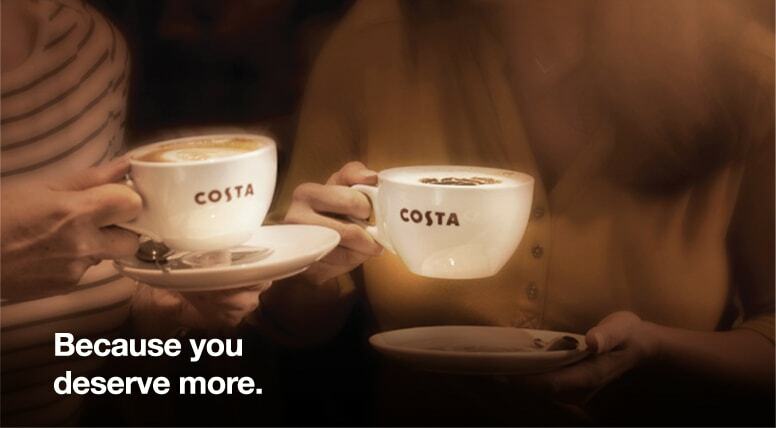 Offer at Costa Coffee is applicable only on Costa Coffee beverages. To be entitled for the discount, your credit card spend for the same month should not be less than BHD 100. In case you avail the offer for a particular month and your total spend on the card does not reach the minimum threshold of BHD 100 for the same month, the discounted amount will be charged back to your account and will reflect in your upcoming statement. The maximum total discount per customer is BHD 12 per month. In case the discount you have availed exceeds BHD12, any excess amount will be subsequently charged back to your account and will reflect in your upcoming statement. 50% discount offer at Cineco will be valid on 2D, 3D and VIP tickets. This offer is valid at Cineco theatres in Bahrain City Centre, Seef Cinema and Saar Cineplex operated by Bahrain Cinema Co.
Visa Platinum cardholders can access over 40 airport lounges worldwide. Please click here to see the list of participating airport lounge under this agreement. Above offers at participating merchant outlets are valid only when the purchases are made using Standard Chartered Visa Credit Cards. Standard Chartered Bank reserves the right to vary, add or delete any of the Terms & Conditions applicable to this offer at any time without prior notice. For more details and complete terms and conditions regarding the campaign and offer, please call our 24 hours Phone Banking on 17531532.